Sorry it's taken so long, but as a sort of 2015 resolution (to make up nice with my readers--both of you), I wanted to write a bit about my favorite meal of 2014. Particularly since it's breakfast, and I'm usually not a huge breakfast person. Now I love a Renaud's croissant as much as the next butter-adoring person short a plane ticket to Paris, but breakfast mostly seems like fuel than fuss, if you ask me. Off to the right are the two eggs over-easy, as asked. But look at that fry on them, giving their overall smoothness a bit of texture that certainly doesn't hurt. And at this point where every dish no matter the meal seems to come with an egg atop so you can yolk all over yerself, we all know the glories of a bit of eggy goo that adds to the richness of, say, some rice and beans. Those corn cakes atop aren't just an afterthought, either, despite being wisely just the right size and not an attempt to make you think you're stuffed. They call them sour cream and tortilla wedges, and no doubt that cream is what elevates them from being mere fat tortillas, adding a lightness and brightness. Plus their fine in the yolk that runs, too. 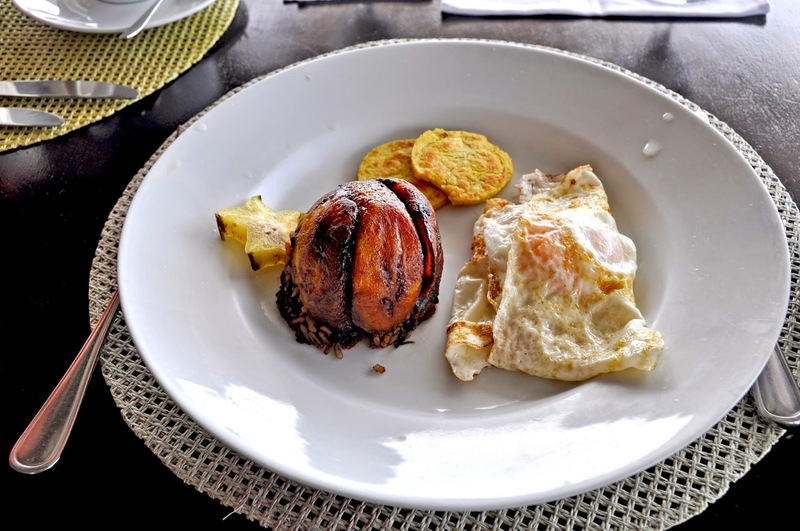 Of course, one reason this breakfast is so good is you have it in an open air restaurant with a view out over the rainforest to the nearby Pacific. So that's pretty hard to beat, but the food doesn't just ride on the location--Gaia is a place of detail and comfort and pleasure. 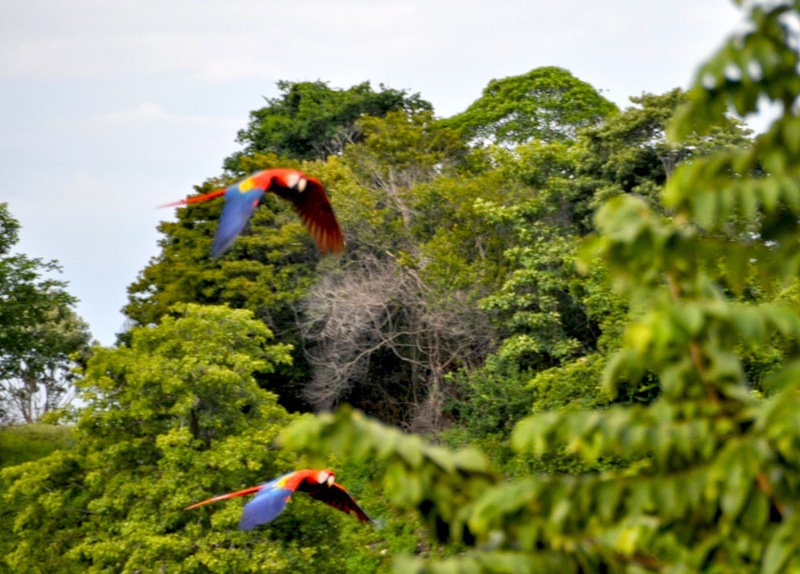 And a place trying to re-establish scarlet macaws to a region of Costa Rican where they've been missing thanks to man for some decades. So while you're eating, every once in a while you'll see blurs like those below zoom by, making their wonderful racket that practically sounds as red as they are. So that's your breakfast dessert.